Frederick Fisher, Principal, Frederick Fisher and Partners Architects, Los Angeles on Thursday, September 22, 2016. The lecture will begin at 7:00 pm in the Forum, Academic Wing, Elaine and Bram Goldsmith Campus, Otis College of Art and Design, 9045 Lincoln Boulevard, Los Angeles, 90045. 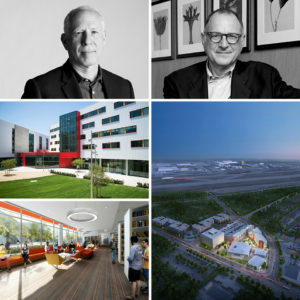 Steven Ehrlich and Frederick Fisher will present their firms’ collaboration as EHRLICH | FISHER on Otis College’s new Goldsmith Campus Academic Building and Residence Hall. The campus-wide expansion and renovation project includes a new academic building, 300-seat Forum (the venue for this lecture), café and dining commons, Student Life Center, and residence hall. STEVEN EHRLICH, FAIA, RIBA, is Founding Partner of Ehrlich Yanai Rhee Chaney Architects, the 2015 American Institute of Architects (AIA) Firm Award winner. The practice’s signature approach known as “Multicultural Modernism” creates meaningful architecture through environmentally conscious designs, cultural meaning, and advances in technology and materials. Ehrlich, a self-proclaimed “architectural anthropologist,” learned early on the significance of architecture’s response to the culture and to the environment. Upon graduating from Rensselaer Polytechnic Institute, Ehrlich spent six years in the 1970s living and working in Africa, serving for two years with the Peace Corps as their first architect in Marrakech, Morocco; he later traveled across the Sahara and taught architecture at Ahmadu Bello University in Nigeria. The wisdom of indigenous building—architecture without architects—was instrumental in forming Ehrlich’s approach to design and continues to influence the firm’s work today. Steven Ehrlich is the recipient of the 2015 AIA/LA Gold Medal and the prestigious 2011 AIA California Maybeck Award. FREDERICK FISHER, AIA, FAAR, brings over 30 years’ experience as an award-winning architect and designer with an international reputation for building seminal academic institutions, museums, and residential projects throughout the U.S., Europe and Asia. At the cornerstone of Fisher’s practice is a deep involvement with art, including artist collaborations, museums, art galleries, exhibits, and art studio designs. He believes that architecture is a collaborative process, and takes a personal interest in every project. His ability to collaborate with clients on projects that convey an enduring design has been the foundation for the firms’ success. Noted projects include: Annenberg Community Beach House, Bergamot Station, Princeton Firestone Library, MoMA PS1, and the Sunnylands Visitors Center and Gardens. In 2013, the American Institute of Architects – Los Angeles Chapter honored him with the Gold Medal, the highest industry honor. Frederick Fisher is also a Fellow of the American Academy in Rome.